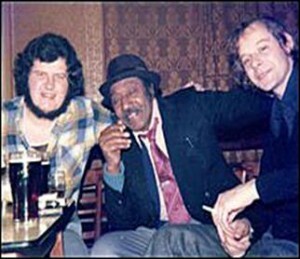 Chris Hodgkins (cornet), Vic Parker (guitar) and Jed Williams (drums); 14th January 1976 at the Quebec Hotel, Cardiff. Here is a short clip of Jazz at the Quebec Hotel Cardiff with Victor Parker on guitar, Bob Tunnicliffe on trombone and Duncan Whyte on trumpet. From a tribute to Victor Parker on BBC Radio Wales 5th November 1980 Vic played with amongst others Dennis Walton’s Cubanaires and the Geraldo Orchestra. This clip is taken from a tribute to Victor Parker on BBC Radio Wales on the 5th November 1980. The photo on YouTube is from the South Wales Echo and was taken in the Quebec Hotel in Crichton Street, Cardiff shortly before it closed.